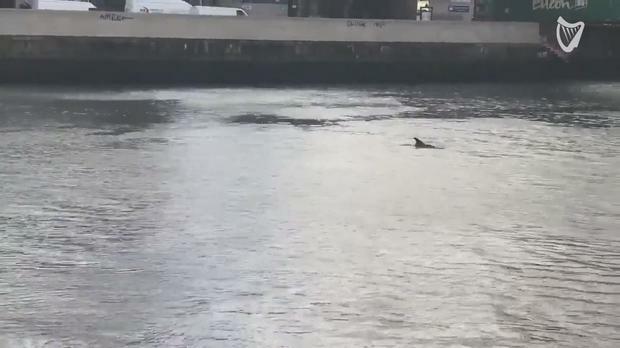 Video footage has emerged of a dolphin swimming in the River Liffey today, with the public being urged "not to interfere with him". The Dublin Society for Prevention of Cruelty to Animals said the animal's sonar is being affected by the weather and he should be able to return to the sea himself. He has been seen swimming in circles near the Millennium Bridge in Dublin city centre. The sighting has created excitement among the public, with many sharing footage of the mammal online. Cormac McQuinn Political Correspondent MEMBERS of the Dáil and Seanad disclosed donations totalling almost €6,500 for 2018. Amy Molloy DUP leader Arlene Foster says that while she sympathised with the partner of murdered journalist Lyra McKee, the party's stance on gay marriage hasn't changed. Conor Feehan Gardai sealed off a large section of Cushlawn Park in Tallaght in the early hours of this morning after a shooting at a house.